When I was in high school, I spent some time on the technical crews of a few of our theatre productions. At the beginning of my first year of classes there, a several-years-long renovation of the school’s performing arts facilities was completed, which meant that suddenly we had access to a world-class theatre in which to perform. The theatre came complete with two balconies, a band pit elevator and a fly system that could compete with a lot of professional facilities. A fly system is the rigging from which the stage lights, curtains and in some cases props and sets are hung. They can be raised and lowered by ropes that run down the length of one of the theatre’s walls, and they’re operated by a fly crew during performances. Thinking about my time working the flies brings double acting cylinders to mind. This may come as a surprise to you, but the backstage area in a theatre can be a little dangerous, and the safety of the working area depends in large part on the competence of the people with their hands on the fly ropes. It’s not hard to understand this if you consider that a given light fixture can weigh 20 pounds or so, and it’s not uncommon for 20 or so of them to be affixed to a single rail during a performance. If the hangings were counterweighed improperly, or if a stagehand mishandled the rigging, all of that weight could come crashing down on top of actors, props and scenery. And let’s not even get started on the potential for rope burns. A safe, well-run performance has to be precise and meticulously planned. I can remember thinking on more than one occasion how much easier things might have been if they could automate, or at least mechanize, all of those backstage processes. Image courtesy of Humphrey Products. I thought of double acting cylinders, not because of their real practicality in this kind of situation, but because they accomplish the same purpose as a fly suspension rig. Just for the sake of demonstration, let’s review what double acting cylinders are and what they do. Image courtesy of Parker Hannifin Pneumatics. Diagram of a double acting cylinder. What makes this kind of cylinder a double acting cylinder is that there’s another intake/outtake port on the other side of the piston. 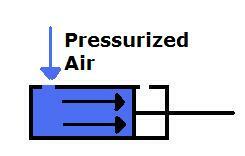 Pressurized air controlled by another source is simultaneously directed into the cylinder from both directions, and the differential pressure influences the positioning of the piston. Changes in pressure influence rod position. 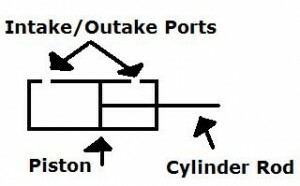 If the pressure on the left side of the piston was relieved, and if the pressure on the right side were increased, the piston would move in the other direction, in turn moving the cylinder rod and whatever load is attached to it. I can’t help thinking that this model would have been ideal for the fly operation in the theatre (I’m aware of the obvious reasons why it really isn’t, and I’ll get to those. What’s great about this design is that the movement of the attached load can be carefully and precisely controlled because of the variable pressures that can be applied on either end of the piston. If the pressure on one end is gradually decreased while the pressure on the other end is gradually increased, the movement of the load could be slow and fluid. A fly system is a system of weights and counter weights; depending on how much is hung from a given rail, it’s counter-weighted so that it’s easier to manage. If it were possible to rig up an enormous double acting cylinder instead of the rope system, the right balance of pressurized air could be used to position the load, eliminating the need for counter weights, guaranteeing fluidity of motion and taking rope burns out of the equation. Unfortunately, this is nothing but a pipe dream (or maybe cylinder dream). In reality, air cylinders typically don’t get much larger than a few feet in length, and in a lot of cases they can be shorter than one foot. They’re used for the positioning of small components in equipment, in robotics, in manufacturing and in a large variety of other contexts. This isn’t to say that even small air cylinders aren’t capable of generating considerable force of motion, but I doubt that it would be possible to create a double acting cylinder large enough for the purposes of raising and lowering things backstage. Despite this disappointing reality, double acting cylinders play an undeniably important role in industry, and that’s not going to change. What’s in a Pneumatic Solenoid Valve?